Kure Bazaar nail polish formula is up to 90% bio-sourced, enriched with bamboo extracts and vitamin E.
BLUSH is a beautiful pink-brown-red, like a "blush powder" for your nails. Made with wood pulp, wheat, cotton, potatoes and corn, this Kure Bazaar nail lacquer preserves the vitality of nails respecting their natural cycle of regeneration. Detoxify your nails with Blush by Kure Bazaar ! Up to 90% of all ingredients are from natural origin (70% minimum). * Kure Bazaar innovative "10 Free" fomula is WITHOUT addition of Toluene, Formaldehyde, Dibutyl phthalate, Synthetic Camphor, TPHP, Paraben, Xylene, Styrene, Benzophenone-1, Benzophenone-3. See INCI ingredients list on the product for most up to date ingredient list. THE new generation nail polish is born : both natural and trendy, Kure Bazaar is the first nail lacquer to combine fashion and eco-consciousness. After years of research, an unique innovation enables Kure Bazaar to use wood, corn, cotton... instead of dangerous chemicals such as toluene, formaldehyde or phtalates... with no compromise on results : high-shine, fast-drying, long-wearing lacquers. 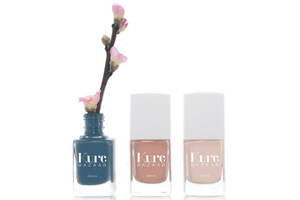 Suit your emerging style, from elegant to daring, with Kure Bazaar natural nail lacquers collection's expert hues. Ecocentric is an online luxury organic beauty and makeup concept store offering the best in made in France premium natural nail polish and lacquer. Discover unique and exclusive organic and natural nail polish brands to buy a natural 4 free nail polish, a water based organic nail lacquer or a natural base and top coat nail lacquer for sensitive or damaged nails.